The Raiders come to us from the Patriot League, where they started 13-10 (5-5). And then, bang: eight straight wins to finish the season, then a clean run through the conference tournament. Including all three Patriot League tournament games, Colgate won seven of its last eight by double digits. Before all that they lost at Syracuse by 21, at Penn State by 11, and at Pittsburgh by 14. KenPom has them at 129th overall; our closest comparison there is Georgia, but I wouldn’t think of Colgate in terms of a team we beat by 46. They’re efficient inside the arc too: 53.9%, 46th nationally. Burns is a great facilitator, 28th nationally in assist rate, and just scored 35 in the Patriot League final. And they get good work inside the arc from 6’9″ Dana Batt and 6’8″ Malcolm Regisford. This team has good size and uses it well at all points on the offensive end. Colgate doesn’t give or take at the free throw line. This will be interesting when dealing with Grant Williams. The Raiders are 284th in free throw rate, and 65th on the defensive end of that equation: they don’t foul, and they don’t get fouled. That suggests far more jump shots, especially when you have 6’8″ and 6’10” guys taking that many threes. Only 16% of Colgate’s points come via the stripe, and only 17% of their opponent’s points. Playing Tennessee could change all this, of course. When playing above their level in non-conference, the Raiders were -20 in free throw attempts vs Syracuse, -14 vs South Florida, -11 vs Penn State, and -9 vs Pitt. That’s a comforting stat, if Tennessee is disciplined enough to take advantage of it and not get into another three-point shooting contest. Turnovers have been an issue. The Raiders give it away on 19.3% of possessions, 232nd nationally, and allow a steal on 10.5% of possessions, 327th nationally. Colgate should have a hard time stopping Tennessee’s offense, no doubt. 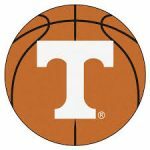 But the best way for Tennessee to win is consistent with the best basketball they’ll need to advance: lock it down defensively. Do not allow a team that’s won 11 in a row and loves the three to get hot. Do not allow a team that’s won 11 in a row and loves the three to get hot. Do not allow a team that’s won 11 in a row and loves the three to get hot. Do not. The Vols haven’t been far enough up the bracket to be in this situation often, but did a nice job of it last year with Wright State: teams seeded 14-16 have some happy-to-be-here in their DNA. The sooner you bring it out, the better.